It can be easy to get caught up in all of the stress that comes along with a wedding. With all of the money, time, and effort that goes into just one day, the pressure to have the perfect day can definitely add up. Social media sites like Pinterest and Instagram often add to the pressure but in reality, no wedding is perfect. So how can you be more relaxed on your wedding day and enjoy the moment? 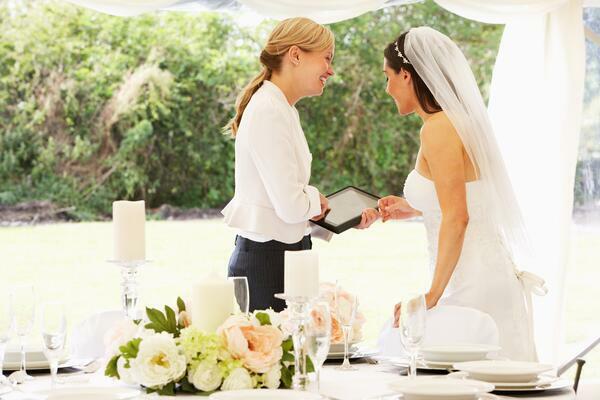 Your wedding day doesn't have to be perfect, but with our tips, it can be less stressful! Wedding planners are expensive and with the easy access to DIY tutorials on the internet, many couples are now taking a do-it-yourself approach to their own weddings. Although planning every aspect of your wedding is a cheaper alternative, it can often lead to you feeling overwhelmed by the number of things you have to do. On your wedding day, you and your partner should be the main focus and you shouldn't have to worry about things going on around you. A day-of wedding planner is a great alternative to a regular wedding planner because it is less expensive and it will still help you stay calm on the big day. The event planner will be the main point of contact and will get and kinks sorted out to ensure you have a beautiful stress-free day! It's important to always keep in mind that it is your wedding and not anyone else's! You don't have to conform to wedding norms if you don't want to. If having a lot of people stresses you out, stick to having your close family and friends around you as you are getting ready. Whether you want to have 300 guests or 30 guests, making sure that your wedding is what you want will ultimately lead to lower stress levels on the actual day. Nothing ever goes according to plan and neither will your wedding. It doesn't matter how much money you put into it or how much you plan, situations will always arise that you will have to navigate. Once you have the mindset that you're prepared for a few bumps along the way, you will be less-stressed trying to make everything perfect. Your guests are excited about the wedding and rarely notice if anything wrong. Have a relaxed attitude and know that everything will work out great! If you're looking for a stress-free entertainment idea that your guests will love, you may want to consider adding a TapSnap photo booth to your big day! Our TapSnap attendants will do all of the work and all you have to do is show up and have a blast taking photos and GIFs! You can see all of the fun features we offer here or you can check your date below!